On 5th August, over 400 trade unions and political activists came to GPO Chouck in solidarity with the protesting Telecommunication workers. The call was made by National Trade Union Federation. The local administration had banned demonstrations on the main Mall Road. For us this was an undemocratic act of the administration, we decided to disrespect this move. There were over a dozen electronic media journalists and scores of print media photographers and reporters on the occasion. They included, Dunia, Express, AAJ, GEO, Apna, Waqt, ARY, Samma, Kohinoor, Royal and some others from private electronic media. The protesters included over 200 women as well. The protesters were sitting on the footpath facing Mall Road. They did not disturbed the traffic. They let the traffic passed peacefully. May be this peaceful act was not a news for the media, or the reason the PTCL is a major advertiser of all the newspapers, the fact is that only Apna and Waqt showed some glimpse of the protest. I am sure if any religious organisation would have mobalised that many on the main Mall Road, it would have broad caste live by these free electronic media. The labour movement have our own traditions of protests. we do not want individual heroism of few but a collective action of the class. We discourage activists who make individual efforts to be in the picture. We want the media to show the whole crowd and not one or two. This is not the commercial media priority. They want sensations, violence and individual acts of heroism. The solidarity demonstration on Friday was from a labour organisation, not linked to any capitalist or feudal political party. It was for the restoration of jobs in an institution that is a major advertiser of most of the private newspapers and television channels, the Etasalat, the new owner of PTCL. I had some contacts with daily Dawn and they got some information from me on telephone for this demonstration on the night, I also emailed the details to them. I was sure that at least Daily Dawn will carry the news. they have done many times. Daily Dawn is very active on social issues and always give a good coverage to our activities in Lahore particularly. I was sure that daily dawn Lahore will print the news. On Saturday morning, I was surprised to see the front page advertisement of Etsalat (U Fone) on metropolitan pages but not a single word of our news. Here, one of the most "respected" newspaper has also shown the same trends of all other commercial media, "take the advertisement and do not print the news against the advertisers". On Saturday, a positive surprise was also on the card. Chairman Parliamentary Human Rights committee, Riaz Fatyana MNA came to the camp and expressed solidarity with the workers. He assured the workers that PCHR will take up the case and will call the Etsalat, ministry of telecommunication and the workers leaders to the hearing of the Committee on this conflict. He will do his best to provide justice to the workers demands. The camp will continue. They will be back on Monday. We will make sure that telecommunication workers are not left alone. We are sending our news on alternative media. We hope to make up the loss being not telecasted or printed on the commercial media by using our own media. I call upon all the progressive forces to use every effort to help this protest camp. Come to the camp on Monday, send a donation, popularise the call on the facebook, twitter or on email lists do what you can, we can defeat commercialism. Workers are out of jobs for one year, we can not accept Etsalat anti workers attitude and bursting of the trade unions inside PTCL. Today over 400 workers turned up to show solidarity with the protesting Pakistan Telecommunication workers at GPO Chouck Lahore. among them were over 200 women workers. National Trade Union Federation had announced a Dharna today on Mall Road to demand for the reinstatement of the PTCL terminated workers. The Etsalat company who had bought PTCL in 2005 had terminated the services of 83 trade union leaders who had organised a national protest in 2010 to demand a wage increase. Instead of listening to workers, Etsalat suspended 600 workers and eventually reinstated most of them apart from the 83 main leaders of the PTCL trade unions. 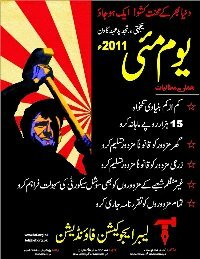 The PTCL workers had set up a protest camp at GPO Chouck since 1st August 2011 to demand their reinstatement. 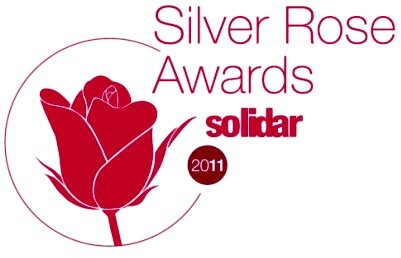 Today, it was a solidarity show of the fellow trade unions. National Trade Union Federation, progressive Youth Front, Labour Party Pakistan, Labour Education Foundation, Women Workers Help Line, Communist Mazdoor Kissan Party, Workers Party Pakistan, Pakistan Trade Union Federation and others participated in this Dharna for over two hours. Speaking on the occasion, Farooq Tariq spokesperson Labour Party Pakistan announced full support to protesting workers. He said that today, we are sitting on road side and not disturbing the traffic but next week, we will picket the headquarters of Pakistan telecommunication office in Lahore., We will occupy the office to demand for workers reinstatement. he said that with the power of the working class,we will defeat the Dubai based Etsalat who had taken over PTCL after privatization. over 50,000 workers have lost jobs since Etsalat had taken over in 2005. Yousaf Baluch chairman National Trade Union Federation, Niaz Khan general secretary NTUF, Azra Shad chairperson Women Workers Help Line, Irfan Choudry president National Student Federation, Sakhi Khan vice president Railway Workers Union CBA Workshops division, Hasan Rana general secretary United Workers Alliance PTCL, Rana Sarfraz, Hafiz Luttufullah of PTCL and others spoke on the occasion and expressed solidarity with the movement. It was decided to continue the protest camp. Today on Wednesday 3rd August, the telecommunication workers of PTCL will continue their protest camp on the second day as well. The protest camp at GPO Chouck Mall Road Lahore, in front of PTCL headquarters was visited by several trade unions and political parties representatives who assured them their solidarity and support. Yesterdays was the first day of Ramazan and workers observed fast but were determined to continue their struggle even during the fast. The United Workers Alliance PTCL is organizing this protest camp. It was decided that the camp will continue till the reinstatement of all the workers who lost their jobs during the struggle for wage increase last year. It was decided by several trade unions to organize a day of solidarity with PTCL workers. On Friday 5th August at 5pm, several hundred of trade unions and political parties’ activists will gather at the camp and show their solidarity with the protesting workers. The protesters are demanding for the reinstatement of all 83 union activists and leaders of PTCL whose services were terminated one year ago when they demanded a wage increase. PTCL under Etsalat has become an anti workers union institution. After privatization in 2005 under General Musharaf, the management never accepted the existence of the unions. In August 2010, when unions demanded wage increase, the management got police to arrest the leaders and charged them with anti terrorist laws. They spent the month of Ramazan in jail. The management also suspended and terminated over 600 workers from jobs, some has been reinstated but the main leadership of the unions is not reinstated. The protest camp will be at GPO Chowk Mall Road Lahore from 8am to 5pm every day. Today on Tuesday, 2nd August, the telecommunication workers of PTCL will continue their protest camp on the second day as well. The protest camp at GPO Chouck Mall Road Lahore, in front of PTCL headquarters attracted a lot of attention by many journalists and fellow trade unionists yesterday. Today is first of Ramazan and the United Telecommunication Workers Alliance decided to continue their protest even on this holy day. It was decided that the camp will continue till the reinstatement of all the workers who lost their jobs during the struggle for wage increase last year. This is to demand for the reinstatement of all 83 union activists and leaders of PTCL whose services were terminated one year ago when they demanded a wage increase. PTCL under Itsalat has become an anti workers union institution. After privatization in 2005 under General Musharaf, the management never accepted the existence of the unions. In August 2010, when unions demanded wage increase, the management got police to arrest the leaders and charged them with anti terrorist laws. They spent the month of Ramazan in jail. The management also suspended and terminated over 600 workers from jobs, some has been reinstated but the main leadership of the unions is not reinstated. The protest camp will be at GPO Chouck Mall Road Lahore from 8am to 5pm every day. United Workers Alliance Pakistan Telecommunication will start its protest camp in Lahore at GPO Chouck Mall Road from 8am this morning. This is to demand for the reinstatement of all 83 union activists and leaders of PTCL whose serivces were terminated one year ago when they demanded a wage increase. PTCL under Itesalat has become an anti workers union institution. After privatisation in 2005 under General Musharaf, the management never accepted the existence of the unions. In August 2010, when unions demanded wage increase, the management got police to arrest the leaders and charged them with anti terrorist laws. They spent the month of Ramazan in jail. The management also suspended and terminated over 600 workers from jobs, some has been reinstated but the main leadership of the unions are not reinstated. The protest camp will remain intact untill the jobs are given back. the protest camp also demand the renationalisation of PTCL. This is to appeal to all the trade unions, social and political activists to join us in the camp from today.